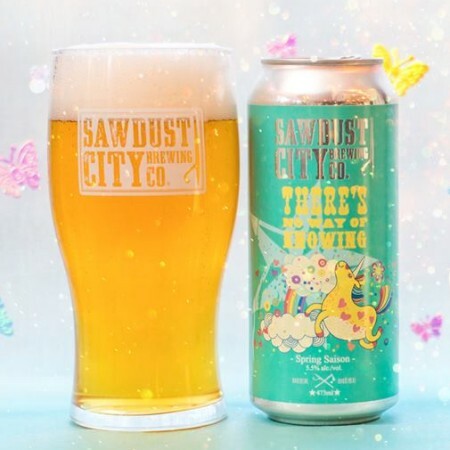 GRAVENHURST, ON – Sawdust City Brewing has announced that the spring instalment in its rotation of seasonal saisons is back for another year. As Ol’ Man Winter begrudgingly releases us from his icy grip, Sweet Lady Spring swoops in and softly serenades us with her song. The snow slowly recedes, the days grow longer and we once again head outside to feel the warmth of a new vibrant season. What does this new season bring us? What does the future hold? Really, there’s no way of knowing. With the bright effervescence of a spring day and flowery aromas of fresh citrus, There’s No Way of Knowing Saison brings us all we love about this season. Light and breezy, it’s the perfect accompaniment to new beginnings. There’s No Way of Knowing is available now in the Sawdust City taproom and retail store.